DSEI will be fast approaching by the 8th June, so we will gather together at St Hilda’s East Community Centre in London to pin down our plans and get more people involved! This meeting will follow the Stop the Arms Fair safer spaces policy. We can offer support with travel, accommodation and childcare costs if that will help you attend this meeting: please email info@stopthearmsfair.org.uk for more information. Free lunch, snacks and hot drinks will be available. There will be vegetarian, vegan and gluten free options available. Please let us know if you have any other requirements, including serious allergies. The venue will be wheelchair accessible with a wheelchair accessible toilet. 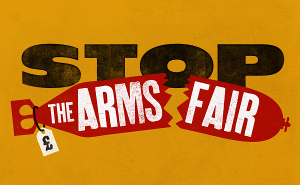 If you have other questions about accessibility, please email info@stopthearmsfair.org.uk for more information.